I'm all for being comfortable, just not at the expense of others. I was cruising through Barnes and Noble the other night searching for the new issue of Blueprint, when I noticed this lady out of the corner of my eye. At first I was struck simply by her position. She looked like she was vegging out at home with her leg thrown across the chair and a bag of food on her lap. 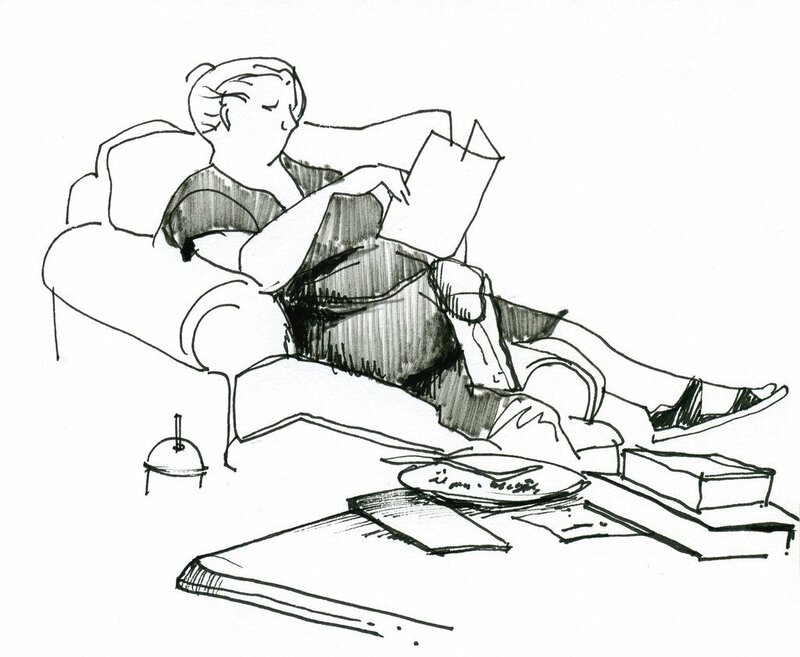 After I found my magazine, I settled into a chair near her and began to draw. It was during this time that I noticed she had spread her belongings out everywhere...her iced coffee, a plate with brownie crumbs, several books and magazines. While I guess this is ok, what appalled me was that when she left, she left all those things just as they were. I guess she could care less that this provided extra work for the employees of the store. I wonder if she's this careless in Barnes and Noble, how she is in real life. In a way I feel like this small incident is just a metaphor for us as humans today. Driving big cars, squandering away fossil fuels, building mcmansions. What are we leaving behind for those that come after us to clean up? Dan Price writes about the Nex Perce Indians who considered the consequences of their actions seven generations down the line. He writes,"If decisions you're making now would adversely affect future people, you change your plan." While I'm not ready to live as simply as Dan, I do think he and the Nex Perce Indians are onto something. So inconsiderate. Unfortunately I see that a lot these days. OH MY!! Such relaxation gloriously caught!! GREAT JOB! Ouch! I stopped by for your requested kick in the pants. I feel your message. We are losing a lot of our culture in my neighborhood as farmlands are sold and Walmart and Applebee's take over. My ex-boss sold his business a few years back and started the following agency to create awareness. If you care to look it is www.agshen.org - I think he has a yahoo group as well. Hi Suzanne! I didn't have your email but wanted to send you a note to say HELLO and ask where in NC you are!! What a fun picture!! Good job!! I think this is the perfect sketch for this slob. You totally captured her nonchalance in your drawing, and its rough quality definitely reflects her rough manners -- or lack thereof. What you wrote about people's overall lack of consideration reminds me of a Ben Folds song -- let me dig it up... Ah, "All U Can Eat", out of the Sunny 16 EP. The musical equivalent of what you (successfully!) conveyed here. I totally agree and I'm glad you caught her on your blog. I'm sure this says a lot about her, her home and her sensitivity to others. Did you say you needed a kick in the pants?? It sure doesn't show, your drawings are wonderful! A few lines, some shadows, some details - but not too much - and you captured the character of this person perfectly. I love the drawing, the story and the story about the 7 generations. That's fascinating. I actually saw something similar the other night at B&N. I was looking at a couple of books on digital painting in a seating area with a few other people. One was a woman who had a whole bag of food and stuff spread out and she had a terrible cold and kept sneezing, coughing and waving her hands around in front of her face, as if to intentionally spread the germs. Beside her was a woman with her feet up on another chair. Yuck! Jana- Your story is sooo gross!!!! I guess there are crimes being committed at B&N all over the country. Perhaps we should start a task force!